Asexual blood stage Analysis of GFP expression in synchronized asexual blood stage parasites in vitro showed GFP expression only in maturing schizonts, as merozoites are formed. Strong GFP expression was observed in the merozoites within the mature schizont. Merozoites showed a 'two-dot' staining pattern which is characteristic for location in the two rhoptry-organelles. The mutant expresses a c-terminal GFP-tagged RAP2/3 (rhoptry-associated protein 2/3). In P. falciparum a low-molecular-weight protein complex, consisting of three non-covalently linked members, RAP1, RAP2 and RAP3 localises to the rhoptries of merozoites. RAP2 and RAP3 are encoded by adjacent genes (PFE0080c; PFE0075c), organised in a head to tail fashion on chromosome 5. 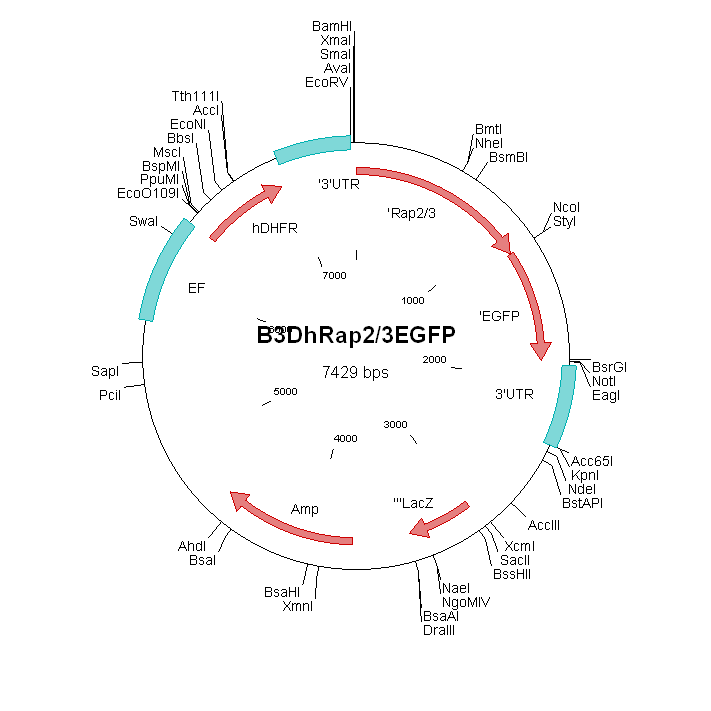 Both rap2 and rap3 show a high homology with the single copy, syntenic gene, rap2/3 of P. berghei. The RAP proteins are implicated in the invasion of the erythrocyte by the merozoite. The phenotype analyses indicate expression of GFP-tagged RAP2/3 in rhoptries of merozoites and rhoptries of the sporozoites. No expression was observed in ookinetes which is in agreement with the proposed lack of rhoptries in this third invasive form of Plasmodium. Additional remarks: tagging The chosen integration strategy for the construct results in integration at the target locus by a single cross-over homologous recombination event. Integration results in the introduction of the gfp gene downstream of rap2/3 together with 0.4 kb of the pbdhfr 3'UTR and the hdhfr selection cassette conferring resistance to the antimalarial drug pyrimethamine.